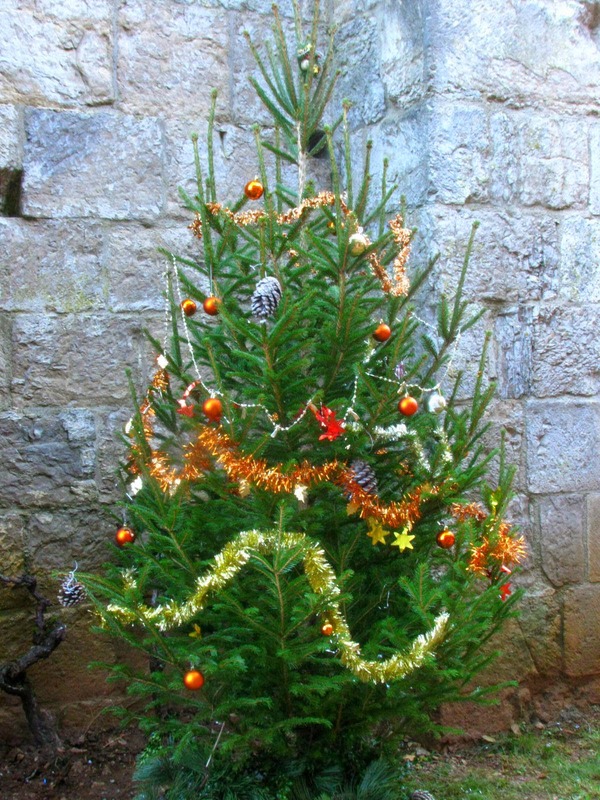 The first weekend in December marks the beginning of the Marche de Noel (Christmas Market) season in most of the villages in rural France. While the bigger cities 'celebrate' Black Friday, it's mostly unheard of here in the country. 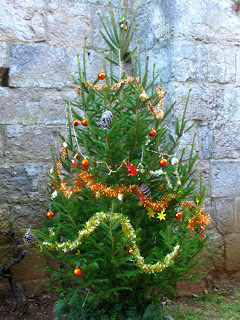 Christmas begins slowly here; nothing much happens until December arrives. Thank the Lord for that! My friends and I decided to visit the new Christmas market that was held in Marcilhac-sur-Cele last weekend. There were a few vendors selling goodies...I bought some freshly-pressed apple juice from a local farm as well as a jar of yummy raspberry/rhubarb jam. Which I have to say, is the first jam I've tasted here that rivals the jam made by my friend, Karen, in Des Moines. 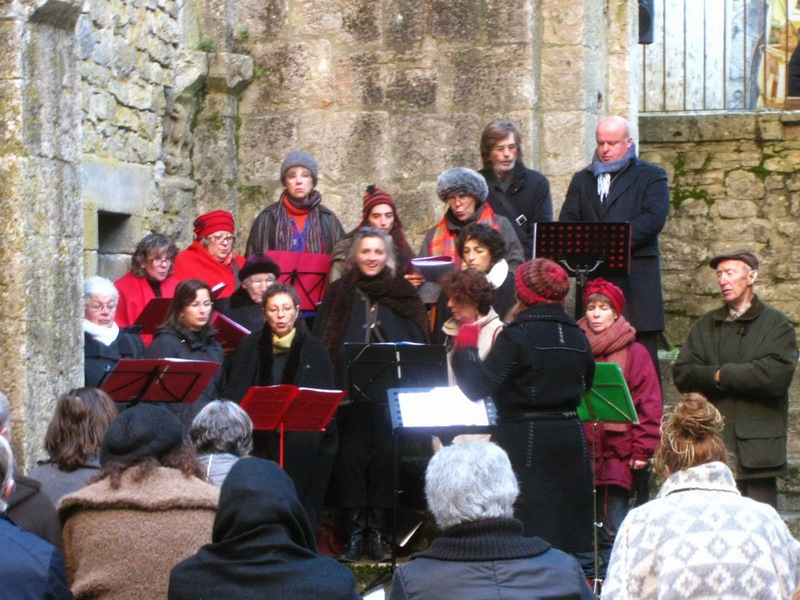 Our local friend, Christine Gentou, had assembled her chorale group in the ruins of the ancient Abbey and gave a short concert of American gospel hymns and a few Christmas carols. As you can see, it was freezing cold in the stone ruins, but the acoustics were fabulous despite no roof and only partial walls. I can only imagine how wonderful the Benedictine monks' chanting must have sounded in this space in the 10th century when the Abbey was built. After listening to the music, we warmed our hands and our hearts with a cup of hot mulled wine and wracked our brains for the name of the third Wiseman in response to a question the market's organizer was posing. We had Melchoir and Balthazar, but it took our friend, Peter, to remember Caspar! After visiting a bit more, we then wandered through the narrow village ruelles which were strung with twinkle lights and large white Chinese lanterns. Hot wine, some music and simple decorations....this is about as 'Christmasy' as it gets here. Nothing is over done. 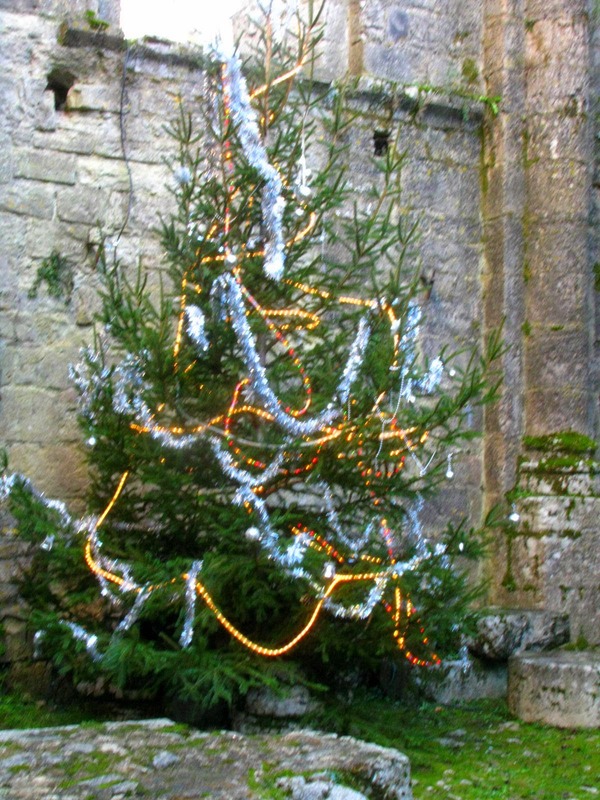 There is no competitive spirit for who can decorate the prettiest or string the most lights. It's all about simplicity, good food, and family at Christmas. I couldn't be happier about that! The only things missing Saturday were those darn dangling Santas...remember them from last year?? I couldn't agree more...Christms is more than sales in the French countryside!